Looking to go out to the movies and can't find a babysitter? 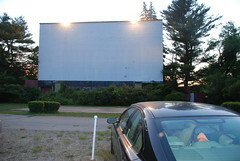 Our solution: drive to Maine and go to a drive-in. There might be drive-ins closer than Maine, but there are none left on Long Island. We used to go all the time as kids, and then as teenagers, and then less often as twentysomethings, as all the drive-in theaters in the area kept closing. I don't think we'd been to one in about ten years. But with a baby, it's the only way to go without spending $50 on a sitter. Violet was a bit fussy at first, but after being fed, she fell right asleep as all kids should at the drive-in. We saw a double feature of Wall-E and Get Smart. And only $14 for the two of us! Get Smart was unobjectionably mediocre - nothing to avoid, but nothing to write about, either. Therefore, nothing else shall be written. Wall-E, however, is further proof in my mind that the only people who should be allowed to make movies are the geniuses at Pixar. Much has been written about the lack of dialog in huge sections of the movie, and that that it's no impediment to enjoying it, but what also struck me is that there were no evil robots. Evil robots would have been the obvious choice. But all the robots in the movie worked to serve humankind well. Too well, as the problem turned out to be. Even the antagonist robot of the major conflict of the film (which the film delightfully takes its sweet time in setting up) wasn't bad - after all, all he (and the giant corporation who set him up) wanted was to keep the humans happy, if not exactly fulfilled. To say more would reveal too much. Okay, that's sort of an excuse not to write any more. But really, this is definitely one of those movies where the less you know going in, the better. So go see it, even at a non-drive-in theater.